Choosing a suitable water fountain is crucial for a pet owner. Some pets can be very picky on what type of water bowl they want to drink from. Especially for some cats who are afraid of the loud sound that a water fountain can makes. Usually it takes time for pets to get used to a fountain. Otherwise, many cats and dogs enjoy the natural sound of free flowing water coming from the fountain. Therefore, pets are more likely to drink more water because the noise attracts them. The result of pets drinking more water equals a happier and healthy pet. Overall, choosing the right pet fountain is important for both the pet owners and their pets. Pet ownership is very popular in the United States and can be one of life’s many joys. They provide love and companionship for people of all ages and can be the equivalent to both a friend and a family member. Many pet owners feel their cat or dog is an extension of their immediate family. In addition to the love and companionship pets offer, they are also a big responsibility because they cannot care for their own needs. Water is an essential element to having a healthy pet and much like people, pets often do not get enough water. A pet fountain can provide clean, filtered water for your pet, which feels like it is coming from a natural stream. Refreshing and encouraging the cat to drink the amount they truly need for a healthy life. Pet water fountains are not just a luxury or convenience item. Simple water bowls must be changed daily or they begin to house bacteria because of the stale water. Pet water fountains provide a way to ensure your pets are drinking from a clean water source. Water is the most important aspect of caring for your pet. Water keeps animals hydrated, healthy, full of energy, and happy. A clean water source will encourage the cat to drink more liquids and prevent disease, encourage healthy kidney function, and keep unwanted bacteria out of their bodies. Pet fountains are small, pet sized, filtered water running in a continuous stream so that your pet’s indoor water will be a positive water drinking experience every day. 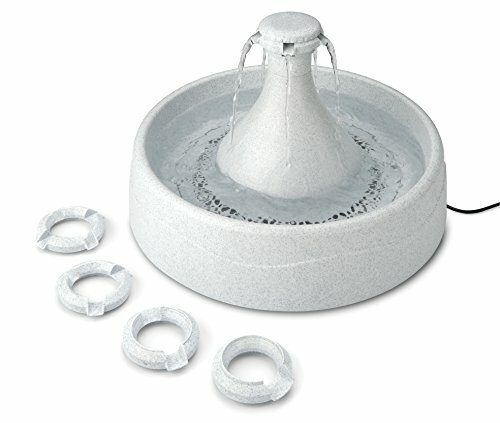 Pet fountains can be found in an array of shapes and sizes, with a variety of features. All have the same goal in mind, to keep our pets happy, healthy, and hydrated. Pet fountains have improved greatly over the past several years providing better quality water, quitter operation, and a more natural feel that pets accept and seek. Pet water fountains have moved from the luxury category into the essential category and provide safe drinking water your pet will love. The PetSafe DrinkWell platinum pet fountain is the top pick because it has a larger capacity, while still being compact and provides a BPA free design for the filtered water. This pet fountain can hold up to 168 ounces of water at a time so it is easily equipped to quench your pets thirst from the littlest critters to the largest ones, enabling you to add water less frequently than smaller models. The PetSafe Drink Well has a free falling water stream created to entice and encourage pets to drink more water while also filtering the water in the process. This pet water fountain has a built in reservoir which increases the capacity and will require less refills. The PetSafe DrinkWell platinum pet fountain can be used whether you are home or away giving you confidence your pet will have plenty of clean and flowing water all day every day. The unit will begin to hum louder when the water levels fall below the minimum. This is the indication that water must be added. The material is a heavy duty plastic made from BPA free materials. This unit is also dishwasher safe for the top shelf (plastic parts only). Also the PetSafe DrinkWell pet fountain has the ability to help prevent urinary and kidney diseases through increased hydration of you cat or small dog. The water free flows like a natural fountain and falls into a bowl at the bottom. This enables even the smallest cat or dog to drink from the water bowl. It contains a carbon filter which filters the water and removes odors and tastes which could discourage your pet from drinking enough water. The filter is replaceable. It comes with a snap on lid so it is easy to add water and replace the filter, yet pets cannot get the lid off. The water flow can be adjusted to accommodate your pet’s preferences. The pump is submerged in the water giving you a quiet operation. The bowl only weighs 4 pounds and has a large bottom base for increased stability. It measures 16 X 10.6 X 10.5 inches in size. The Pioneer pet raindrop oval stainless steel fountain is a top pick because it offers a compact design made from long lasting stainless steel material. It offers a natural circling motion in which the water runs. This circular motion appeals to both small dogs and cats and appears more natural and fresh to your pet. This fountain includes a charcoal filter for clean, pure, and healthy water that with filter throughout. The filter is replaceable and cost effective. The Pioneer pet raindrop oval stainless steel fountain is dishwasher safe (except the motor) and constructed of high grade stainless steel that allows for easier cleaning as well as a sleek and modern design. The pioneer raindrop fountain has a capacity of sixty ounces which is more than enough to keep all your furry friend hydrated and is large enough capacity to reduce the frequency in which water must be added and will last while you are away. The fountain features a center spout which is adjustable. You are able to move it around or control the volume for your pet’s convenience or comfort level. This is one of the fewest stainless steel models available and it won the Editor’s Choice Award in 2010. The pump is very quiet and oxygenates the water and is quiet enough t be placed in any room without concern over the noise. This unit is only 4.5 inches high and 10 X12 weighing only 1.7 pounds. It also comes with a 6 foot power cord for added convenience. The PetSafe DrinkWell 360 pet water fountain is a top pick because of its unique design and quality build. This water fountain has an effective filtering system and can hold up to 1 gallon or 128 ounces of water. It features a unique 360 design that can accommodate multiple pets drinking at the same time. The clean water comes out from the top like a traditional fountain. You are able to choose from 1 of 5 different water flows depending on your pet’s preferences. These are interchangeable. This feature is valuable because as the pet ages or becomes use to drinking from a fountain their preferences often change. The PetSafe DrinkWell 360 also includes a replaceable carbon filter which is designed to remove bad tastes and odors as well as filter out hair and debris. This fountain is made from BPA free plastic and is dishwasher safe (except the motor) making it very easy to clean and maintain. The fountain also features a controllable flow cap in the fountain so you control water flow and are able to reduce spills or accidents. The fountain only weighs 3.8 pounds and measures 13.5 inches in diameter and the center is 8 inches tall. Pet fountains can be an excellent way to keep your pets hydrated while at home or away and grants your pets fresh drinking water around the clock. All of our top picks are dishwasher safe and provide fresh filtered drinking water for your animals. They are all compact and lightweight designs with long lasting motors. The Drinkwell Platinum offers the largest capacity and holds up to 168 ounces of water, with the DrinkWell 360 holding 128 ounces and the Pioneer holding the least at 60 ounces. The Pioneer is also the lightest fountain at only 1.7 ounces. Both DrinkWell models are designed from BPA free plastic where the Pioneer is unique with a stainless steel design. The 360 model offers a true fountain type design that gives room for multiple animals to drink at the same time. 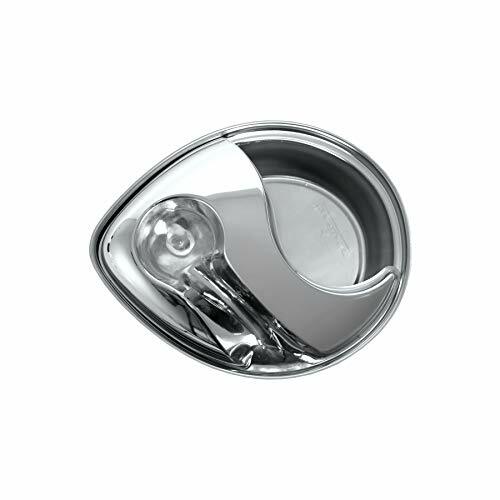 The DrinkWell Platinum has a waterfall effect with a back to front design where the pet drinks from the front of the bowl. The Pioneer can be accessed from the top or bottom and is great for one small pet, partly due to the small tank size. Whichever fountain you choose; your pet will be able to access fresh filtered drinking water to help them stay better hydrated. Pet fountains are a wonderful addition to your home and grant your pets many health and comfort benefits. Before selecting your perfect pet fountain there are some questions that will help you identify which pet fountain will best meet your needs. Where will your pet fountain be used? Pet fountains come in a variety of shapes and sizes and can be used in any room in the home. Size and noise levels will factor into your choice of fountains based on where the unit will be placed. How many pets do you need to provide for? The next step to choosing the best pet fountain is to look at the size and number of pets that will be using the fountain. This will impact both the design and capacity you want to consider. How often will you need to add water? Capacity is a key factor into what size fountain you need. If you go away for the weekend you may need a few days of water supply. Larger animals drink more than smaller animals and impact capacity requirements. What type of stream best suits your pet? The stream of a pet fountain is the way and direction that the water runs out. Some pets like the more natural circling water flow that bubbles rather than flows. Other may prefer a waterfall effect where they drink directly from the falling water. 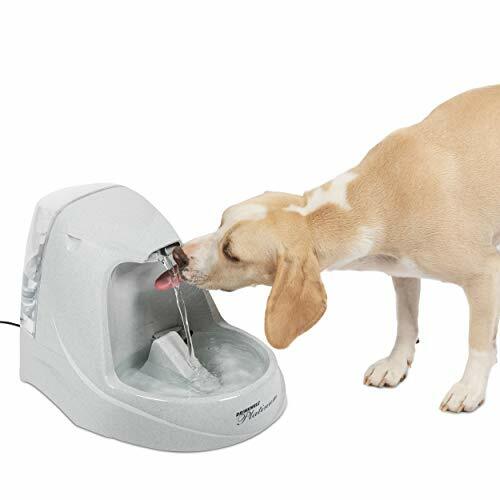 The ability to adjust the water flow will help you customize the pets water fountain to their drinking preferences. Circular Stream the circular stream that is available in some pet fountains is as it sounds, the spout would sit at an angle instead of on top like in traditional fountains and then push and circulate the water in a round motion that may appear more natural to some pets. This approach may be quieter and more calming to some pets verses a higher sitting spout. Waterfall Stream The waterfall stream is a feature that allows water to fall while flowing and is said to entice and encourage pets to drink more water more frequently. Increased consumption of water leads to better health in pets and can reduce disease and increase their life, just as proper hydration does for us. The stream effect will be louder and larger animals like dogs often drink directly from the water flow instead of from the reservoir at the bottom. Motor Noise. All pet fountains offer a motor which generally gets louder when it needs water added. The sound of the motor will play a factor in where it can be placed without disturbing you. Water filtration Water filtration cleans and purifies the water. Replacement costs of the filter and how many gallons it purifies will factor into the long term cost of the fountain. A water filtration keeps dust, debris, out of the water as well as eliminating chemicals from the water which impact its taste and small. Cleaning Method If you intend to wash your pet fountain by hand you may want to search for materials such as stainless steel which are more hygienic and easier to clean than plastic models. The ability to wash in the dishwasher can make any material easy to clean. BPA Free is a feature to look for with plastic bowls. This is healthier and safer in both the using and cleaning process. Material Used. The most common material found in pet water fountains is plastic. All plastic should be BPA Free and be strong enough to take the constant flow of water. Stainless steel options are more hygienic and typically are easier to clean and will last longer. They are also newer to the market and often cost more. Pet fountains not only provide a safe clean environment for water but they also filter the water to keep your pets from ingesting unwanted bacteria. The running water from the fountain encourages them to drink more water, more often which has significant health benefits such as avoiding kidney diseases, protecting the urinary tract and avoiding infections. Pet fountains are a great way to give your pet the health benefits of drinking more water in a clean and safe environment. They make an excellent addition to your home. They can have large capacity which also provide peace of mind while you are away from your home.